WOW! Another day of amazing snow conditions! After the previous day's surprisingly (even shockingly) excellent snow conditions on the south side of Rainier (see previous TR), there was only one place to go: right back there! Even all the way from Seattle -- thankfully Greg and Riley picked me up in town, so at least I avoided driving there 2 days in a row. We decided to spice it up with an attempt on Little Tahoma, which I'd finally skied last July via the NE approach (see TR), but never yet from Paradise. This involves crossing the Cowlitz and Ingraham Glaciers to reach the Whitman Glacier on Little T's southeast flank (see the excellent route photo on page 230 of Mount Rainier: A Climbing Guide, 2nd ed, 2005). We registered with climbing ranger Arlington Ashby (I'd skied Inter Glacier with him last year), who was manning the Guide House which was open for special hours 6am-3pm on May 8-9. We headed out on skins around 9am, and as expected from yesterday, required ski crampons to ascend Pan Face and the rolls above (6400-7000 ft). We then continued on without them, angling eastward onto the Paradise Glacier near 8000 ft, and crossed onto the Cowlitz at 8400 ft, stopping atop a rocky outcrop to don harnesses, but leaving the rope in Greg's pack. View from about 8400 ft across the crevasses of the Cowlitz Glacier which we traversed through, with Little Tahoma rising far beyond. The traverse across the Cowlitz Glacier required angling upward to 8900 ft to avoid a steep rollover slope, skiing down 100 vert into a small bowl below some large blue seracs, and then (after roping up) reascending near 8900 ft, above a major jumble of steep broken crevasses and ice cliffs. The route went nicely, with only a single snow-bridge across a less-than-ski-width crevasse, and everything else filled in safe and fat. 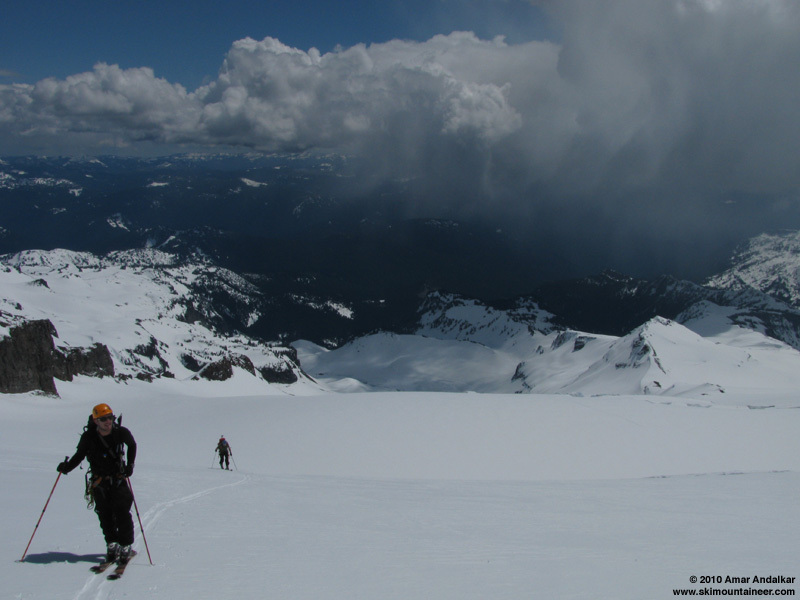 An even safer route can be found by going much higher, say up to 9200+, which would require no crevasse navigation at all right now, but the Cowlitz-Ingraham cleaver needs to be crossed at 8450 ft, so going high is not necessarily worthwhile. Meanwhile, noon had come and gone, and as they did yesterday, ominous dark clouds were building all around, including near the summit of Little Tahoma. Once again, those to the south were pouring showers from their undersides. Was it worth skiing down 500+ vert to reach the 8450 ft crossing, then navigating across the unknown crevasses of the Ingraham, and crossing the 8800 ft gap onto the Whitman, only to be caught in a sudden whiteout with thundersnow or hail? 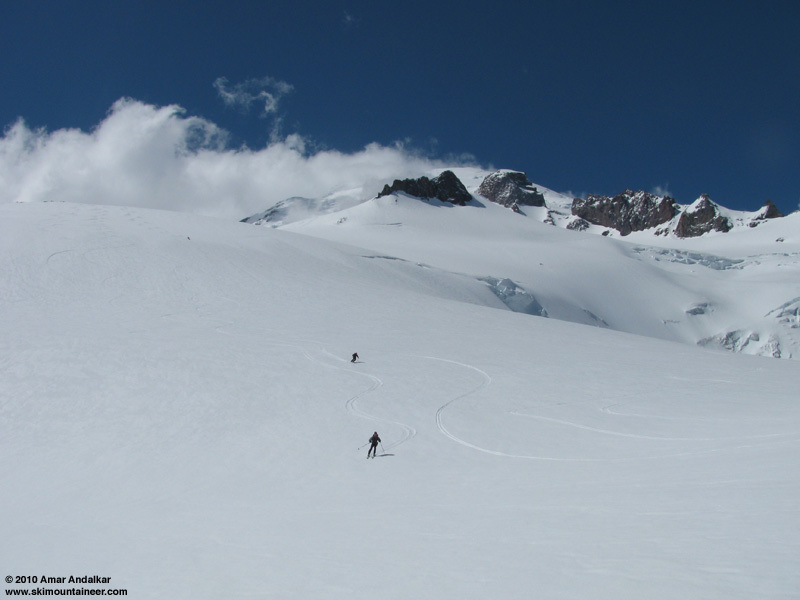 We thought not -- not at all -- so plans were quickly changed to instead continue up the Cowlitz to Camp Muir, and then ski down via the Cowlitz and Paradise Glaciers. So we continued upward, suffering a bit in the blazing solar oven of the semicircular Cowlitz cirque. Looking down the Cowlitz Glacier, with clouds building and showers falling, all too close by. Reached Muir around 1:30pm, sunny and pleasant, even nicer and less breezy than yesterday. I chatted with some friends for an hour, while Greg and Riley eventually skinned up Cowlitz Cleaver to about 10500 ft, to get a few extra turns on the upper Cowlitz. We skied down at 2:40pm, with one of the Muir folks joining us to form a group of four, enjoying excellent smooth turns on the Cowlitz. We made a swift angling traverse near 9200 ft below Anvil Rock, below the schrund and above other crevasses, to reach the Paradise Glacier. 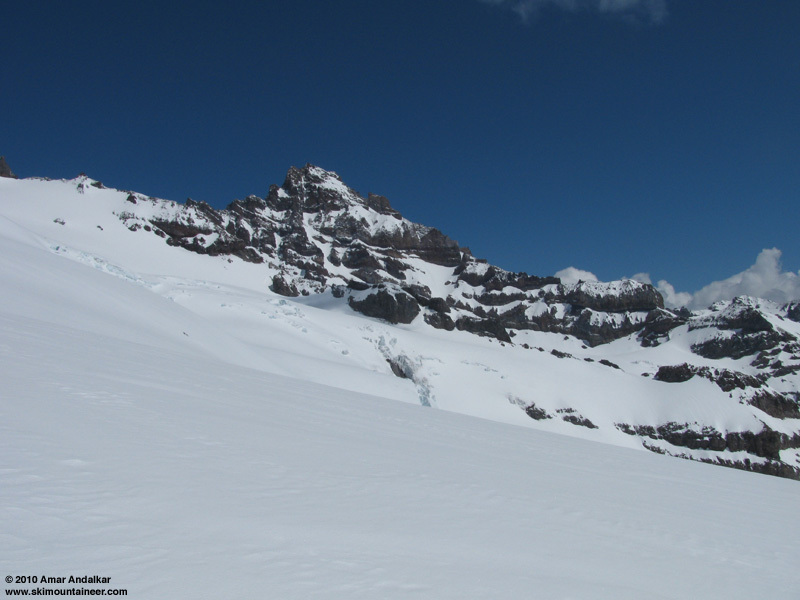 Best turns of the day on the Paradise Glacier, with the Cowlitz Glacier at right. And then the snow got really good, even smoother, better consolidated, and just electric! Proto-corn at its best. Arcing huge turns, hundreds of yards in radius, across the vast untracked expanses of the Paradise Glacier, reaching some of the highest speeds that I ever dare to attain off the groomers. My partners, one of them a former East Coast ski racer as I was (but far better), agreed that the snow was just superlative and spectacular. The earlier threatening clouds had largely dissipated, leaving a pleasant partly sunny sky, but the snow conditions were so amazing that we had no regrets about not attempting our original objective. We were simply ecstatic, with ear-to-ear grins all around. We exited out via the bowl of the erstwhile lower Paradise Glacier, crossing several huge piles of avy debris below the cliffs, one of them with man-size blocks like some evil alpine talus field. We angled up through the edge of the cornice onto the plateau, skated across, and reached Golden Gate without donning skins. A quick drop into Edith Creek Basin, and a long schuss along its western edge brought us back to the parking lot in short order with no hassle at all. Just like yesterday, snow conditions remained good all the way to Paradise, with no stickiness and minimal glop anywhere along the way, even at 3:40pm. Another magnificent day on the Mountain, with a scenic and unusual approach to such an oft-visited destination, matched by an exceptional and memorable ski descent on hero snow. The forecast called for one more day of sunny weather, so it was only right to go for the Rainier south side trifecta� -- see next TR. SYNOPSIS...A WEAK UPPER TROUGH AND LIGHT SURFACE FLOW WILL RESULT IN MOSTLY SUNNY SKIES AND TEMPERATURES NEAR NORMAL ACROSS WESTERN WASHINGTON TODAY. SHOWERS AND ISOLATED THUNDERSTORMS WILL BE GENERALLY LIMITED TO THE MOUNTAINS DURING THE AFTERNOON AND EVENINGS. A WEAK UPPER LEVEL RIDGE WILL MOVE THROUGH THE AREA ON SUNDAY. ANOTHER UPPER TROUGH WILL MOVE ACROSS THE AREA MONDAY BRINGING A CHANCE OF SHOWERS. AN UPPER RIDGE WILL BRING DRY WEATHER AGAIN FOR THE MIDDLE OF NEXT WEEK. SATURDAY...MOSTLY SUNNY IN THE MORNING...PARTLY SUNNY WITH A CHANCE OF SHOWERS AND ISOLATED THUNDERSTORMS IN THE AFTERNOON. SNOW LEVEL 5000 FEET. SATURDAY NIGHT...MOSTLY CLOUDY. A CHANCE OF SHOWERS AND ISOLATED THUNDERSTORMS IN THE EVENING. SNOW LEVEL 5000 FEET. SUNDAY...MOSTLY SUNNY. FREEZING LEVEL 6500 FEET. SUNDAY NIGHT...MOSTLY CLOUDY. A CHANCE OF SHOWERS AFTER MIDNIGHT. SNOW LEVEL 5500 FEET. MONDAY...CLOUDY WITH A CHANCE OF SHOWERS. SNOW LEVEL 3500 FEET. MONDAY NIGHT...CLOUDY WITH A CHANCE OF SHOWERS. SNOW LEVEL 4000 FEET. TUESDAY AND TUESDAY NIGHT...MOSTLY CLOUDY. FREEZING LEVEL 6500 FEET. WEDNESDAY...PARTLY SUNNY. FREEZING LEVEL 7000 FEET. WEDNESDAY NIGHT...MOSTLY CLOUDY WITH A CHANCE OF SHOWERS. SNOW LEVEL 7000 FEET. THURSDAY AND THURSDAY NIGHT...MOSTLY CLOUDY. A CHANCE OF SHOWERS. SNOW LEVEL 7500 FEET. FRIDAY...MOSTLY CLOUDY WITH A CHANCE OF SHOWERS. SNOW LEVEL 7500 FEET.